Oh, that's like super basic stuff. I love kimchi! Now, my love for those delicious fermented vegetables has also been picked up by my family members including my mom. Tried making some at home too and thankfully they turned out great! My brother and my mom loves the good ol' style Baechu kimchi that is made from cabbage and I personally love the crunchiness of Kkakdugi which is a Diced Radish Kimchi. I also had my own hands-on experience of making the Oi Sobagi, the Cucumber Kimchi which was greatly enjoyed by my family too. My point is? Korean dishes are fun and easy to make (mostly) as long as you have the passion and interest in them. And if you are, this hobby of yours might be your ticket to win up to RM4000 and a chance to be sponsored for an All Expense Paid Round Trip to Korea! All participants will also receive a souvenir as a token of appreciation for the support. A total of 16 teams will be chosen by the embassy to battle it out on the contest day, showcasing their best version of 'Pork Free Korean food that can be enjoyed by all Malaysians'. The participants will be judges under these following criteria including; taste, composition, hygiene, plating, and degree of difficulty of the dish presented, originality, globalization, and passion for Korean Foods & Culture. Additional bonus points can also be given to those eligible for it. You can download the 2018 Hansik Contest Guidelines for more information on this. 1. Must be a Malaysia citizen. 2. Applicant's parents cannot be of Korean descent. 3. The applicant and his/her parents must never have had Korean nationality (Korean adoptees are eligible). 4. Applicant must be able to travel to Korea in September 2018 with a valid passport. So, what are you waiting for? The contest is still accepting applicants up until the deadline on Wednesday, 25th July 2018. 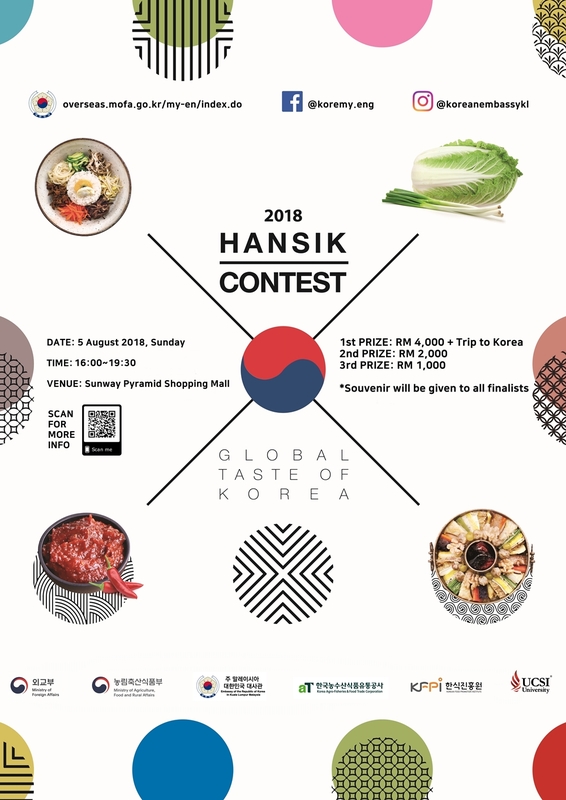 You can learn further about the contest and how to register by visiting the Embassy's website or for further enquiries, kindly contact hansikmy@gmail.com or 03-42512336 (Ext 111). Good luck!